The Parish Flood Board is situated outside the Library in Datchet, which will show one of the three triangles shown below. Flooding is possible, be prepared. Flooding is expected, immediate action is required. Please click here to visit their site if you have been affected by flooding. or visit the Royal Borough website by clicking here. Please click here to visit the Environment Agency website Flood pages. Please click here to sign up for Flood alerts. Call Floodline on 0845 988 1188, select Option 1 and enter Quickdail number 173197 to get more information. Visit www.gaugemap.co.uk for current River Flow and Ground Water levels. We have a number of advice leaflets on what to do on a number of safety issues, to do with flooding, these can be collected from the Parish Office. 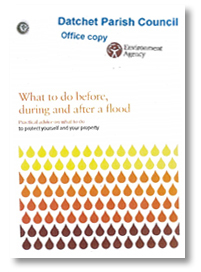 There is also a new leaflet provided by the Environment Agency on hat to do before, during and after a flood available from the Parish Office and online. Never ever risk your life or the life of someone else trying to save you, a property, or a pet. Try to keep calm at all times and listen to what the flood warders say. Use a stick and walk slowly through any flood water to ensure you are aware of any holes, ditches, kerbs or other such hazards. Keep out of standing water as much as you can. Keep children from playing in flood water as there are health risks. When you come into contact with it wash your hands carefully. Keep dogs out of flood waters. Contaminated water will soak through into their fur. The following external links provide some further information about flooding in the area. Please note that the Datchet Parish Council is not responsible for the content of external internet sites. Environment Agency flood warnings for the Datchet area. The latest flood maps can now be found at the Environment Agency. You can enter your postcode to found out how at risk you are. The Flood Risk Action Groups (FRAGs) were set up by the Environment Agency and local authorities following the January 2003 floods. Further information can be found from their website. 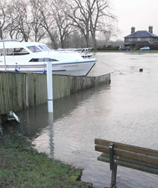 Ongoing discussion about the downstream Thames flooding can be found at the Thames website.